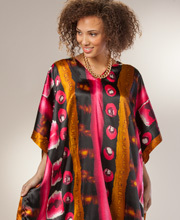 Flowing caftans (also spelled kaftans) are worn as relaxing lounge wear. 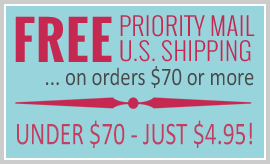 What is a caftan? 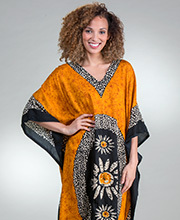 A caftan is a fluid comfort garment, usually long with loose sleeves, sometimes worn as casual lounge wear, women's sleepwear or as a beach cover-up. 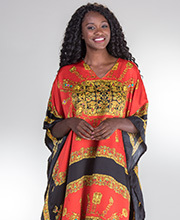 Caftans have been worn historically as a traditional garment (see our Moroccan and African styles) but today, the kaftan has experienced revived popularity as a comfort respite from form-fitted streetwear. 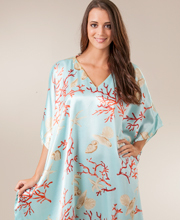 Browse our selection of caftans in a variety of colors, patterns and fabrics including cotton, rayon, denim and satin. 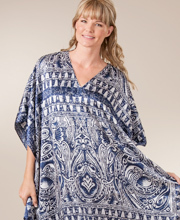 We also carry some fabulous housedresses, updated style muumuus, lounger and patio dresses - all wonderfully relaxing lounge wear.